If the pinch to zoom feature in your iPhone or iPod Touch is not enough for you, now you can change the font size of Mobile Safari web browser with a simple jailbreak tweak called Magnifier for Safari. 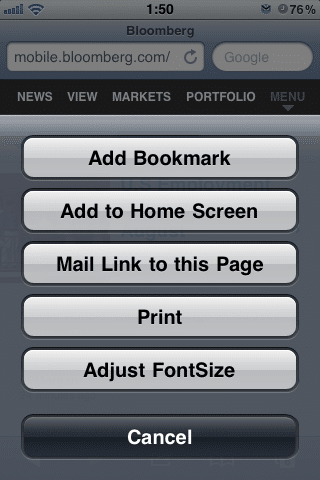 This jailbreak tweak allows you to adjust the font size in the iPhone or iPod Touch web browser, Mobile Safari. This tweak is very easy to use once you install it. All you have to do is locate the “Adjust FontSize” option which is located at the bottom of ” Add Bookmark.” A slider bar will appear at the bottom of the screen and from there you can adjust the font size however you like, and no icons will be added to the homescreen or Settings. As always, you can find this tweak in the Cydia BigBoss defaulted repo at a price of 99 cent.